Bedding Information: Queen size Bed and bunk beds built into the wall. 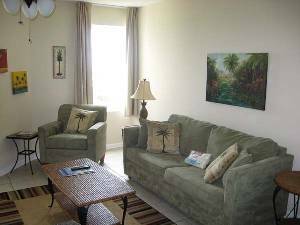 The Grand Caribbean Unit 323 is a beautiful condo which offers views and convenience in a perfect location for beachcombers, runners, kayakers and cyclist. The Shoppes at Palm Pointe shopping center is anchored by a Publix and is in walking distance with pedestrian traffic lights. The Grand Caribbean Unit 323 has 18" X 18" tile throughout with diagonal tile in the bedroom and diagonal tile on the balcony. 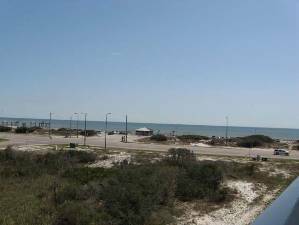 The balcony has high end sling patio furniture for a comfortable view of cotton bayou and the Gulf of Mexico. 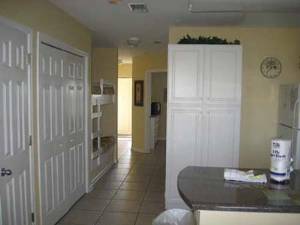 You will enjoy a full size washer and dryer with double shelving above. 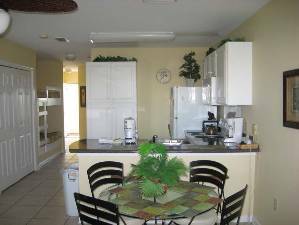 The unit is sophisticated and comfortable in decor and amenities, a beautiful well maintained vacation condo at great price! The Grand Caribbean is right next to a paved path which leads to the Hugh S. Branyon Backcountry Trail with 20 miles of trails for running, biking and walking. The Grand Caribbean has an outdoor swimming pool, two elevators and outdoor grills. 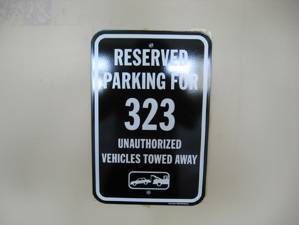 Unit 323 also has an assigned parking spot under the building keeping your vehicle out of the hot sun and staying dry on those rainy days. Looking to the right, view from balcony. Looking to the left, view of Cotton Bayou. Assigned parking spot under the building. Bedroom with a queen size bed and a 32" tv. Enjoy your stay at the beautiful Grand Caribbean. 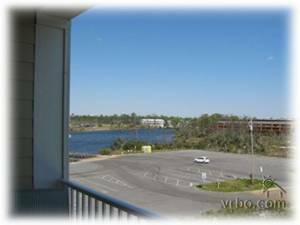 My condo is comfortable with a great view of Cotton Bayou and the Gulf of Mexico. 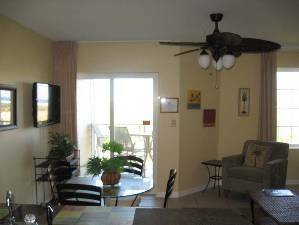 To book this condo please call Brett Robinson at 1-800-211-7892 and ask for Grand Caribbean Unit 323.